The Dry Lake solar energy zone (SEZ) is located in Nevada in Dry Lake Valley in a semiarid basin with undeveloped scrubland. The SEZ is located on BLM-administered land within the Southern Nevada District. There is one pending solar application within the Dry Lake SEZ (Application 84052, for a 919 acre parabolic trough facility). In the Draft Solar PEIS the proposed Dry Lake SEZ had a total area of 15,649 acres (63 km2). 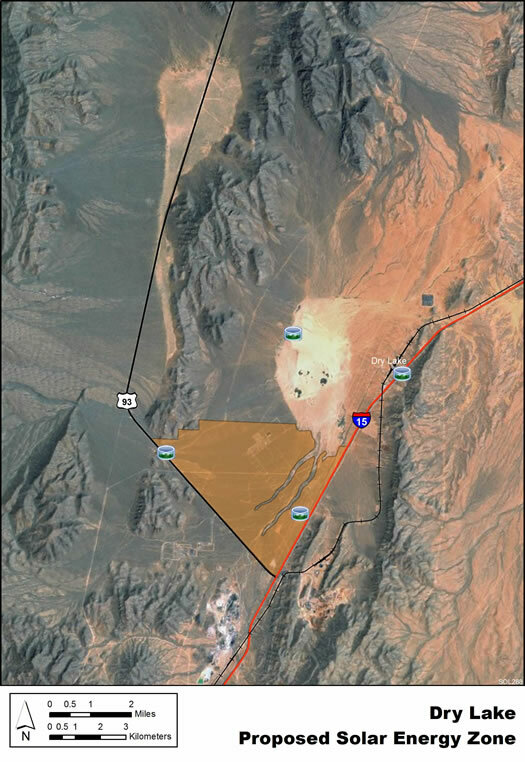 In the Supplement to the Draft, the SEZ was reconfigured to include only the southernmost area northwest of I-15, in order to mitigate impacts on various resources, including impacts on desert tortoise and potential impacts on military operations. In addition, 469 acres (1.9 km2) of floodplain and wetland non-development areas within the remaining SEZ boundaries were identified. The remaining developable area within the SEZ is 5,717 acres (23 km2). No additional changes to the SEZ developable area were made in the Final Solar PEIS. The Dry Lake SEZ is located in Clark County in southern Nevada, in an undeveloped rural area in Dry Lake Valley, bounded on the west by Arrow Canyon Range and on the southeast by Dry Lake Range. In 2008, the population of Clark County was 1,879,093. The towns of Moapa and Overton are as close as about 23 mi (37 km) northeast and 26 mi (42 km) northeast of the SEZ, respectively. The land within the Dry Lake SEZ is undeveloped scrubland, characteristic of a semiarid basin. Vegetation within the SEZ is predominantly creosotebush and other low shrubs. Lands within and near the SEZ contain multiple transmission lines and related facilities, several power plants and other industrial facilities, mining operations, I-40, other roads, and a railroad. In addition, there is debris scattered throughout the SEZ. The nearest major roads accessing the Dry Lake SEZ are I-15, which runs along the southeastern border of the SEZ, and U.S. 93, which runs along the southwest border of the SEZ. Two designated transmission corridors that are heavily developed with numerous natural gas, petroleum product, and electric transmission lines (including a 500-kV transmission line) pass through the SEZ. As of May 2012, there was one pending solar application within the SEZ.